Different types of marijuana are called strains. The 2 main types of marijuana are indica, and sativa. Indica provides a more heavy narcotic effect often referred to as "couch lock," which is excellent for pain and sleep. Sativa provides more of an uplifting, thought provoking, energetic and happy effect. Most all marijuana is a blend of indica and sativa. If a strain has a higher percent of indica, the indica effects will dominate, and strains that have a higher percentage of sativa bred into the plant will have the sativa effects dominate. 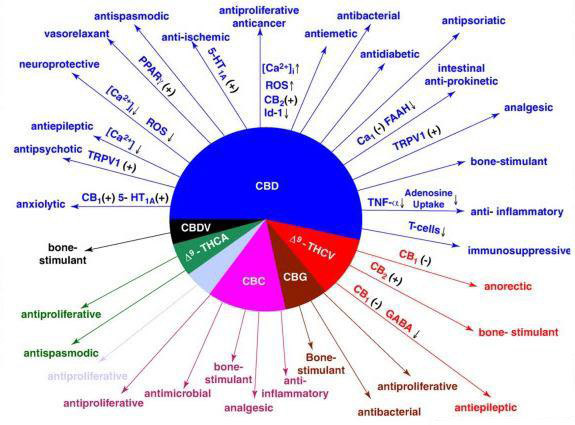 There are many marijuana molecules that play a role in the healing process. Some of those molecules are only now beginning to be understood. THC is one of the marijuana molecules that plays a role in healing, as it is a powerful antioxidant, as described in the patent assigned to the U.S. Dept. of health. However, a strain with a very high amount of THC without very low balancing molecules, such as CBD, can have an effect that may be too strong for some people. Balanced marijuana is closer to mother nature, and has more of a balance of the marijuana molecules THC, and CBD. For those patients who tried marijuana and felt too strong of an effect, simply trying another strain with lower THC and higher CBD may better provide the intended effect for that patient. Afghani #1 is a classic. Compact, easy to grow, and potent, it is exactly what you’d expect out of a landrace Afghani. Lots of resin production and a hashy, earthy taste and its couchlock indica high are great, though they don’t often measure up to today’s fancy hybrids. Strong smell, compact buds, great yield, and easy to grow. Compact stature. Look for the cherry smelling pheno. High is cerebral but not overpowering. This is a great sativa for those who don’t have the time for a plant like Haze. It tends to be very branchy, but it’s very forgiving to grow, and has a remarkably short flowering period for such a sativa plant. It has an up, creative high and a lemony taste. If you’re looking to get the highest yield per plant possible, Big Bud is where it’s at. Unfortunately, its other characteristics don’t match its yield. It has a skunky but not powerful smell, and the high is typically indica. Between its low potency and the low ceiling of the high, it doesn’t make the best medical marijuana. Mr. Nice’s Critical Mass is a rebreed of Big Bud that fixes some of the potency issues. Big Bud is also very susceptible to bud rot and other kinds of mold. Blueberry is very unique marijuana. It tends to turn from partially purple to full on blue, and if grown properly smells and tastes like blueberry muffins. The high is euphoric, uplifting, and comfortable. Blueberry can be difficult to grow, and is very sensitive to nutrients. Be sure not to overfeed. Bubblegum tastes and smells exactly like what the name suggests. It has a powerful, euphoric, narcotic, indica stone and is very easy to grow. It is of medium to tall stature, and generally not very branchy. California orange, when grown well, has a sweet orange taste, but the potency is definitely lacking. The high is fairly typically indica, though not overwhelmingly so. It’s a pretty forgiving plant to grow, but it fails to excel in any one aspect. Chronic was bred to be a good commercial variety. It isn’t a branchy plant, and it doesn’t respond well to topping, but it grows giant buds, which makes it well suited for SOG. Its mild, sweet smell and typical indica stone are nothing special but pleasant nonetheless. If you want a sativa high but don’t have the room or the time to do it, C99 is for you. The high is all sativa—heady and racy. But it flowers very quickly, and though it’s stretchy, it’s nothing like growing a full sativa. The taste and smell are a combination of citrus and floral, very refreshing. The most outstanding characteristic of F-13 is its amazing, powerful, and clear high. The second is that the plant turns purple, sometimes fully so but usually only partially. It grows like a stretchy sativa, but it’s nowhere near as bad as a landrace and its short flower time keep its stature in check. The smell and taste are a combination of earthy and vanilla-y. Haze is an interesting plant in that it actually makes a better breeder than it does a grower. It passes on its best characteristics, but alone, it's hard to grow and not worth the trouble. It has a sweet, sandalwood, spicy taste, and a very up, sativa, energetic high. It takes forever to flower, needs a ton of headroom, and is very sensitive to nutrients, so it’s not recommended for beginners. Hindu Kush is a short, single-cola dominant indica that produces fat, sweet buds with a heavy stone. It is remarkably easy to grow, and has a very short flowering period. Perfect for SOG. Strong, skunky smell and a knockout indica high combined with being easy to grow and a good yielder make this both a grower’s and a smoker’s favorite. Its short stature and big, fat, greasy colas make it perfectly suited to a SOG. Jack Herer’s sativa phenotypes are average-yielding and Haze-dominant, while the indica dominant phenos look more like NL#5 and yield excellently. Both phenos have an up, energetic, sativa high, and are completely covered in trichomes. Jack Herer tends to be a stretchy plant, so be sure you have enough headroom, especially if you have the sativa phenotype. Kali Mist is a nearly pure sativa with a potent, up, energetic high and a hazy, pine taste. It stretches dramatically, so make sure you have room to grow it. It’s very mold resistant. Great headstash but not for beginners. Lavender turns a very pretty purple color, and has a sweet, herbal, spicy candy taste. It has a classic, heavy indica stone—not daytime medicine. It’s fairly easy to grow, and can be a very good yielder if given the right care. LUI is a great indoor plant—potent, good yielding, and easy to grow. It tastes like candy, and certain specimens can even change colors. Tight, compact buds and a heavy indica stone, as the name suggests. Short, compact stature. Mazar has a nicely balanced indica/sativa high and is an exceptionally easy, forgiving plant to grow. It is compact in stature and there is little phenotypic variation. Maple Leaf Indica is a knockout indica from Sensi’s vintage Afghanica stock. Abundant resin production makes it great for hash making. The taste is syrupy sweet with some citrus. Expect little stretch and dense nuggets. Mr. Nice is a knock-down, drag-out indica to rival any. It has a hashy, earthy taste, and its resin production is out of this world—great for making hash or other extracts. Its high is extremely munchie-inducing and put-you-to-bed potent, and it’s fairly forgiving to grow. Neville’s Haze is an almost pure haze with some Northern Lights bred into it to tame it somewhat for indoor growing. However, it is still not a plant for the novice or impatient. It will wrap itself around the lights very quickly, and it takes forever to flower. But if you’re looking for the classic haze high and taste, look no further. NYC Diesel is best known for its citrus-grapefruit-lemon-fuel stench. It’s not quite as potent as Sour Diesel, but it packs quite a punch. The high is powerful and sometimes overwhelming, with both sativa and indica effects. Be sure you have enough odor control when growing this. One of the first successful hybrids of sativa and indica, Northern Lights changed the world of indoor growing. It combined a short flower period, a very high yield, good potency, a short, bushy profile, and ease of growing—a perfect indoor plant. The high is a classic indica couchlock, and the taste is hashy and earthy. It’s more of a grower’s plant than a smoker’s plant, but it’s always a safe bet. Romulan is a very strong mostly indica that tastes and smells like rotten fruit and black pepper. It is a striking dark green mottled with dark purple. Short plants and dense buds make this a good choice for a SOG setup. Shiva Skunk has a musky, skunky smell and a heavy smoke with mixed sativa and indica effects. It grows with indica dominant traits, and is remarkably hardy. Though the haze is brought under control somewhat by the NL influence, this is still very much a sativa dominant plant. It stretches dramatically, the buds are airy and elongated, and the high is pure psychedelic sativa. Outrageous resin production makes this great for making kief or hash. Skunk #1 is the classic from back in the ‘90s. Remember the stuff that made you think you’d just hit a skunk when you opened the bag? This is it. Easy to grow with consistently good yields, but if you smoke too much the high can get uncomfortably racy. Sour Diesel has a stench like no other: citrus sour with ammonia, diesel fuel and skunk. It punches you in the face with an extremely powerful high and doesn’t let go. Sour Diesel is very sensitive to light leaks, but if treated well it will give you some of the best smoke you’ve ever tasted. Expect significant stretch. A sweet, strawberry smell and taste and a comfortable, dreamy, euphoric high make this a nice smoke, but it is a relatively low yielder and produces leafy, airy buds that are hard to trim. Don’t expect every example to smell like strawberries, either—it may take a little imagination with some. Super Silver Haze is one of the most revered strains in cannabis lore. It won the 1997, 1998 and 1999 Cannabis Cups in a row, and for good reason—its soaring, euphoric high and floral, sweet taste and smell are truly unique. The more indica phenotypes have the potential to be monster yielders, but the sativa phenotypes are generally more potent. Super Skunk is a great first plant to grow. It’s hearty and hard to kill, it yields well, and its smell harkens back to the skunky, pungent stench that pot smelled like before all of the berry and diesel strains took over. Though its sativa parentage means it stretches more than your average indica, it makes a great indoor plant that will reward hard work with giant colas. Sweet Tooth is a favorite of commercial growers in Canada. Hearty, easy to grow and a great yielder combine with a heavy, sedative stone and an almost cloyingly sweet taste to make this a prizewinner several times over. Trainwreck is a mostly sativa plant from Humboldt County, California that is famous for its pepper/lemon/catpiss smell and its powerful, up high. Expect big, fat colas with a pungent pine-lemon-sweet aroma. Hearty plants with good mold resistance make this a good choice for beginners. Some stretch, but minimal. The high is on the psychedelic side of indica, but less so in the phenotypes that lean toward LUI. A spicy strong smell, killer resin production, and a knockout high combine to make this super-potent indica a famous one. The high can actually be too intense for some, so beware. White Rhino’s particularly forgiving to grow, though it can be susceptible to mold. This is an F1 cross that results in stable, medium height plants with dense, resin-covered tops. The potency is in line with what you would expect from a cross between two legends such as these. White Widow can be too potent of a smoke for some, but those who can handle the intensity of the high get to enjoy one of the most legendary plants of the 1990s. 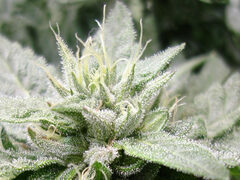 A combination of high resin production and a pale shade of green makes the buds appear “white”, hence the name. Recommended for: epilepsy, multiple sclerosis, and other seizure-related illnesses. (Big Bang) Used to sedate and relieve stress & anxiety amongst sufferers of severe anxiety,etc. Cannabis cup winner, the reviews mention its medicinal properties.